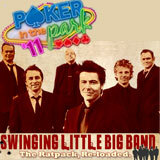 The Swinging Little Big Band will be playing on the Main Stage at Poker in the Park on Friday, 2nd September. One of the UK’s most energetic and exciting live acts, the band perform vintage Rat Pack-style swing / jazz with a uniquely modern twist, Vegas-style renditions of contemporary tunes, from Smells Like Teen Spirit to Radiohead’s Creep. You can get a preview of their unique sound at www.littlebigband.co.uk. “It’s the marriage of old Vegas cool and modern pop culture that makes the Little Swing Band the perfect soundtrack to Poker in the Park,” said organiser Michael Caselli. Poker in the Park is Europe’s biggest free poker festival and hits London’s Hanover Square on 2nd and 3rd September. Last year 20,000 poker fans flocked through its doors to celebrate all things poker and rub shoulders with the likes of Liv Boeree, Devilfish, Neil Channing and Evander Holyfield.